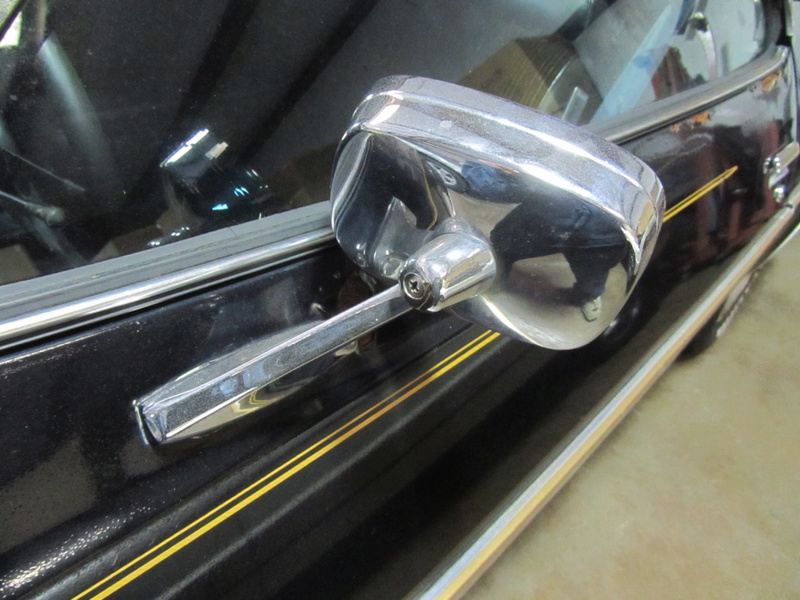 The driver's door chrome (standard, not sport) mirror on my '76 Sprint had the glass broken out of it prior to my ownership and somebody bonded a random piece of glass to it. The housing and controls are still in decent condition, and I would like to find a replacement insert even though I sourced a nice entire assembly for when the car gets restored. Can these mirrors effectively be disassembled? I removed the single screw mounting the head to the arm, but found the three control cables permanently(?) attached to the glass backing plate. Pics attached, thanks in advance. You'll have to take the mirror completely off to get the cables out of the main part of the mirror. This has to be done by taking the door panel off and threading it out of the door. That's what I suspected.....thank you. I'd like to know the answer to that, also. I messed with this once when trying to either replace the broken plastic control knob housing or the entire cable assembly. Could not figure out how to disconnect the wires at the mirror glass plate, so tried it at the control knob. Didn't figure that end out, either...so, tossed the mirror in the trash. I'm guessing the only feasible solution is to remove the glass from the mtg plate and have new glass installed. If anyone would know it would be you Mcarlo77. I was just assuming that it would be the same as the sport mirrors, but I could be wrong. It was a sport mirror I was messing around with. Just assumed they would be the same as the chrome mirrors; although I have never compared the two. 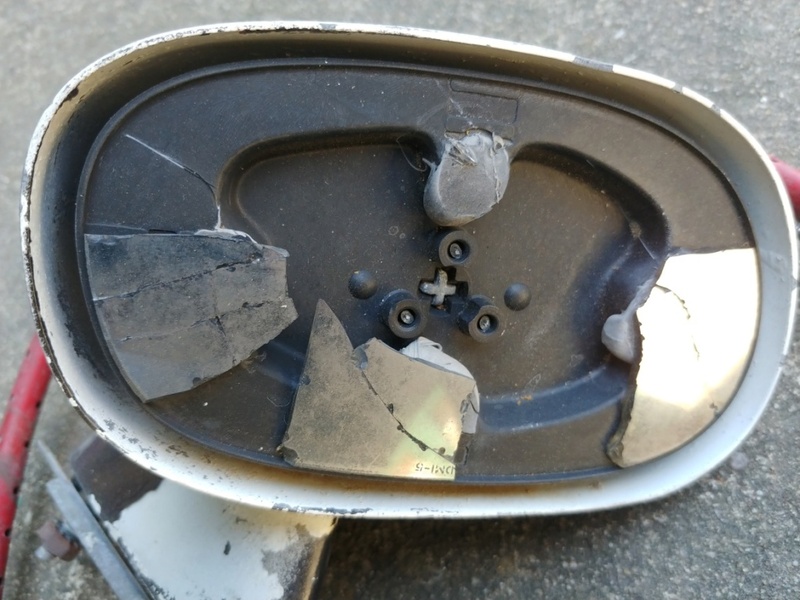 Anyway, I have another sport mirror from my old '76 Laguna in front of me with the same issue of broken tab on the plastic housing of the control knob. Here's a photo of where the cables connect to the glass backing plate. Looks to me like they pass thru the plate and are maybe somehow fastened on the other side where the mirror glass is glued. Messed around with trying to release the wires on the control knob end again and darned if I can figure it out without causing further damage to the plastic. There are several places on eBay selling replacement glass for the mirrors. Is it possible to just break the non original mirror out and replace it. 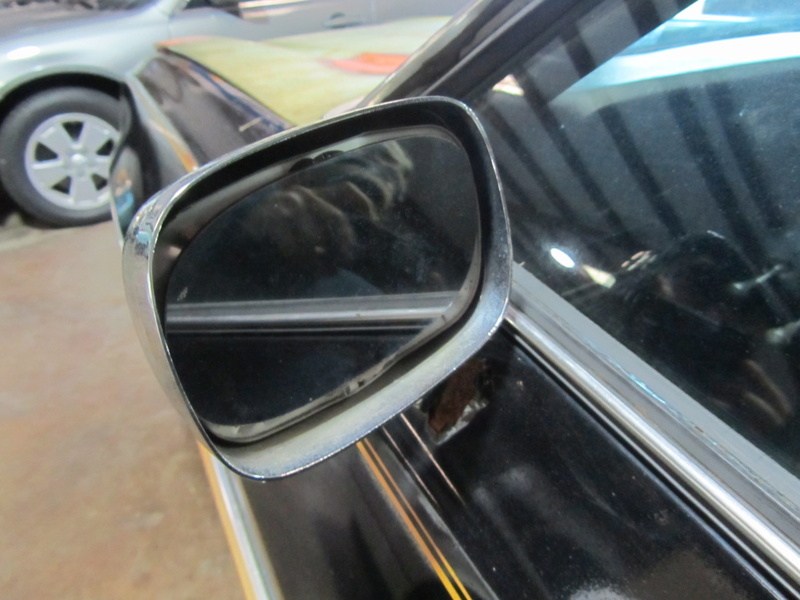 There is also a couple used mirrors if you wanted to use until you restored your car. I'm sure it's possible to remove the glass and replace it. Question is...is it worth the time and effort (chipping off broken shards of glass from the backing plate doesn't particularly thrill me). I suppose it might be if you have a nice chrome mirror without the typical rash and pitting. However, sport mirrors are a dime a dozen and, except for the need to paint it to match the car, doesn't seem worthwhile. Glad this came up. I had a spare passenger side sport mirror painted but it didn't have glass, the guts were in there but not the glass. I wasn't sure if I could just replace the glass or just the guts. I don't know what's available in replacement mirror glass. Might just be easier to find a nice, used mirror and swap out the insides. That would be easier. I did want to try and convert them into electric so I maybe I should start that conversion, lol. Hawk03 wrote: That would be easier. I did want to try and convert them into electric so I maybe I should start that conversion, lol. Document it better than I did. Which means 'any'. Hawk03 , the glass is available aftermarket for the type of mirrors on your car. If interested , I would have to look through my receipts to find the part number. 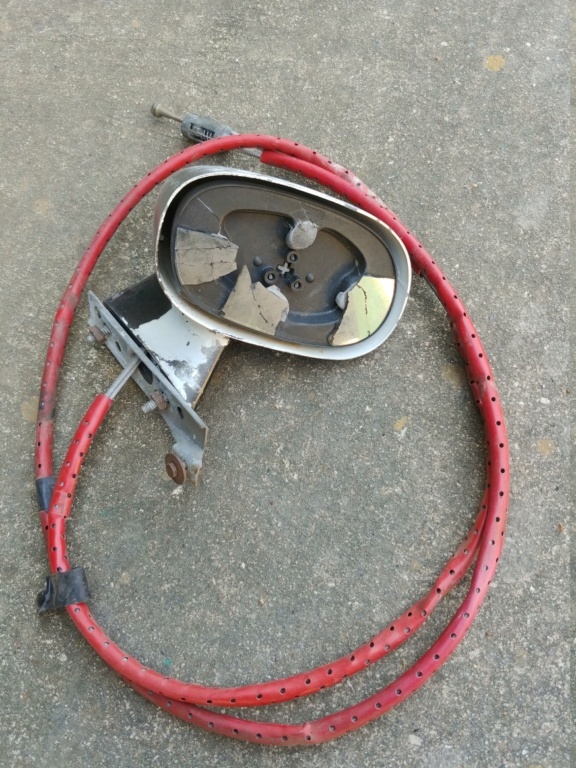 Speaking of mirrors, if anyone following this thread is interested in a NOS RH chrome mirror, here is rare offering on e-Bay for a fair price. lol, I was going to use your quick write up. I'm not good at documenting anything. impalamonte wrote: Hawk03 , the glass is available aftermarket for the type of mirrors on your car. If interested , I would have to look through my receipts to find the part number. Thanks. I will probably just switch out the guts of the one on the car now. Somehow some paint chipped on the mirror thats on the car. If it helps, if you show me some pics as you go, it'll probably jog my memory and we can tag-team it. Cool, thanks. I need install my aux fuse boxes first. I bought some boxes and wire, I just need to map it out. I'll ask those questions in my other thread. FWIW, here is a pic of a damaged remote mirror I have that shows the mounting points behind where the glass would be. There are 4 points where the factory used some high strength adhesive of some sort which makes it near impossible to remove the glass without being damaged. I have successfully remove glass before using a heat gun but it took a lot of finesse to get it done. 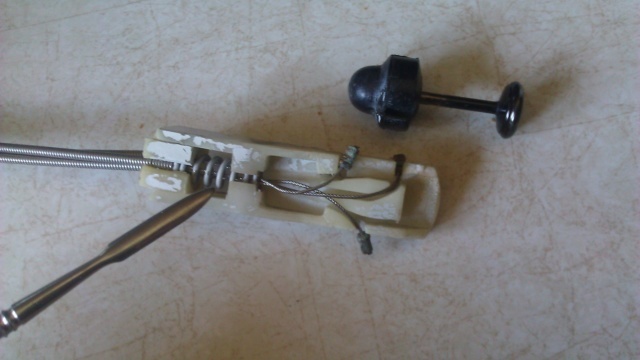 The pic also shows how the control cables terminate inside the mirror base. BTW, the glass on a right hand remote mirror is near impossible to find since its slightly smaller than a non-remote. I had to have the replacement glass from a non-remote mirror ground down with a glass sander used for stained glass to make it fit properly. In the picture that g3chevy provided for that particular style of mirror......How do you get the right hand mirror controls from a remote controlled housing into a non- remote controlled housing? Has anyone done this and how do you do it ? Well...it doesn't appear that the cables can be removed from the mirror side. And, I can't figure out how to remove them from the knob control without further damaging the plastic retainer housing. Without one or the other removed, there is no way to swap them. Maybe I'll mess around some more with the one I have and try to figure it out if there is a way. I have installed right hand remote hardware in a non-remote mirror housing. The non-remote mirror housing I used already had the hole in the base to feed the cables through. I'm not sure all non-remote mirrors are setup this way on the passenger side. But all the bullet mirrors I've seen on the drivers side have this hole. Otherwise the mirror hardware itself mounts the same way on both sides within the mirror housing. The hole for the cables is approx. the diameter of the head of one of the mtg screws...so, it could be easily drilled. The question we've had is how to string the cables thru as they must be removed at one end or the other for the remote assembly to be removed from one mirror and swapped into another. I just got done playing around with my spare LH side mirror and finally discovered how the three cable ends can be detached from the control knob. Takes much patience, but this now allows the wires to be removed from the control knob plastic housing and passed thru the mirror base for a swap into another mirror. Exactly Mcarlo77.....I have one that I would like to swap....I'm just afraid I am going to compromise the brittle plastic parts of one ...or the other. And I wonder after snapping those wires out....if the plastic will not be "sprung" and unable to "bite" onto those cables to make it usable as it was intended. Mcarlo77 wrote: The hole for the cables is approx. the diameter of the head of one of the mtg screws...so, it could be easily drilled. The question we've had is how to string the cables thru as they must be removed at one end or the other for the remote assembly to be removed from one mirror and swapped into another. I just got done playing around with my spare LH side mirror and finally discovered how the three cable ends can be detached from the control knob. Takes much patience, but this now allows the wires to be removed from the control knob plastic housing and passed thru the mirror base for a swap into another mirror. You do not have to disassemble the control knob fixture to remove the mirror assembly from the outer mirror housing. 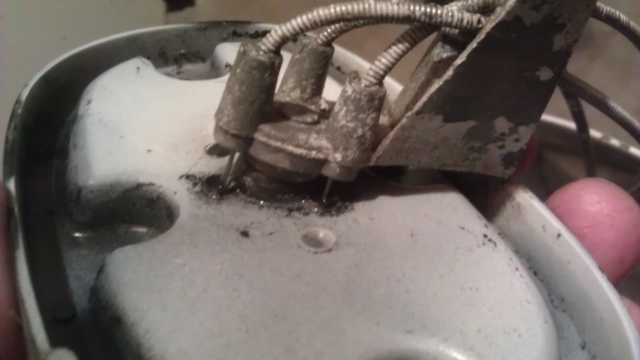 The hole in the base of the mirror housing is large enough for the control knob to feed it through. I'll will try to get some pics later today to show how it comes apart. Ummm...I don't know where you got your sport mirrors, but the three I have laying around off these 73-77 cars only have a .40" dia. hole thru the top of the mirror pedestal for the three cables to pass thru on their way to the back of the mirror glass on the upper half. 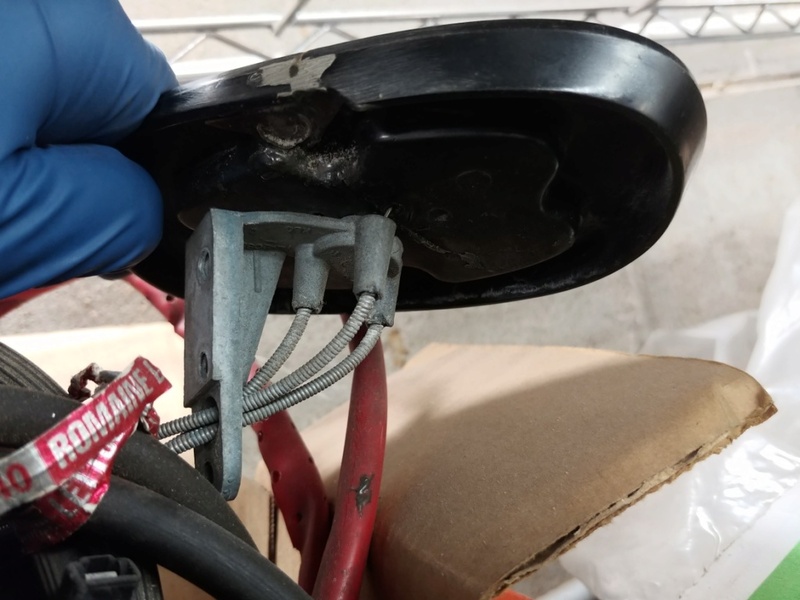 It's not even remotely possible to completely separate the top portion from the pedestal of the mirror and remove the mirror glass backing plate assembly without disconnecting the wires from one end or the other.